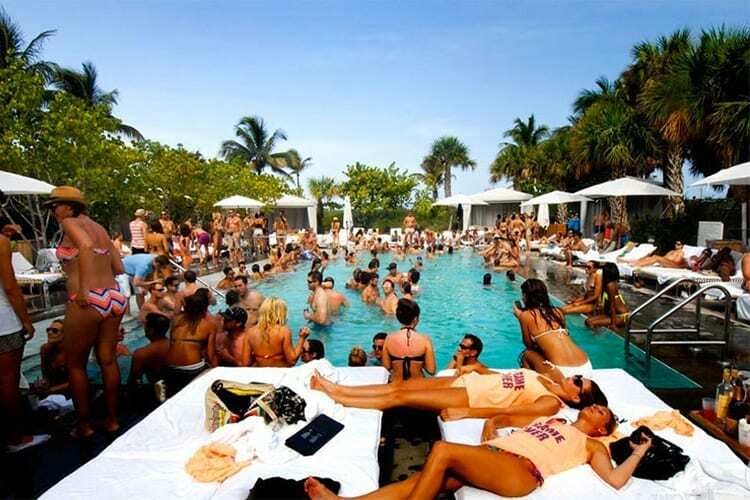 Shots are where it’s at in Miami’s party scene, and people start knocking them back first thing in the afternoon, thanks to all the amped-up, epic pool parties. 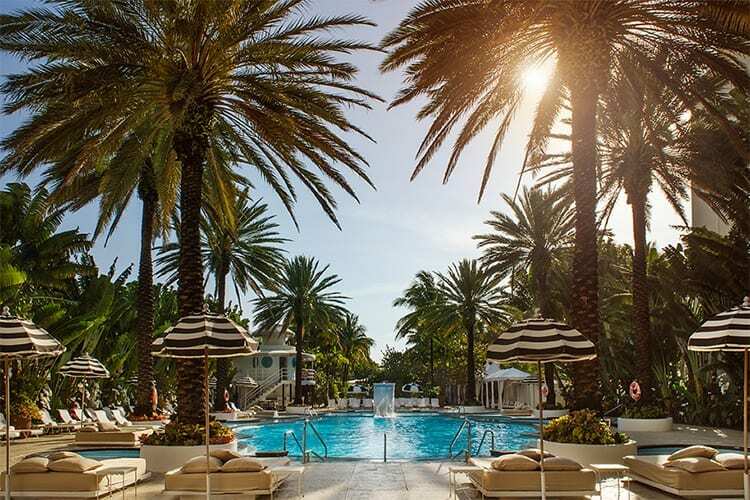 With live DJs, bottle service and crazy hot chicks, a pool party is your first stop in Miami, and these are the only places you’ll want to booze up, bro down, and get your tan on. SLS Hotels built its entire hotel chain with party people in mind. The hotel group has lively party restaurants, wild bars and, depending on the location, crowded pool scenes. They didn’t hold back at SLS South Beach, which is basically the cream of the crop. It’s a feast for the eyes with an extra playful vibe, thanks to legendary designer Philippe Starck’s 10-foot rubber duckie. The scene is a loud, packed, debaucherous affair, with a mix of socialites, models and celebrities. Running both day and night, it’s really become the Vegas of pool party scenes here. Just to make things clear, The Freehand is a hostel. 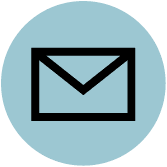 It’s an “upscale” hostel, which means it’s not getting the shady backpacker-on-a-budget variety but more the hipster millennial that wants to socialize when they travel. But hostel or not, it’s a magnet for young groups due to its famed bar, The Broken Shaker. Considered one of the best bars in Miami, The Broken Shaker has good vibes, good cocktails and good music. Taking all this further is the pool scene. 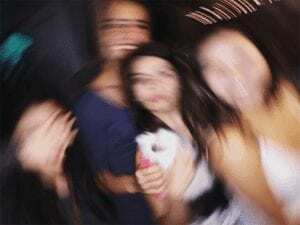 It’s not raging by any means, but it’s where the party’s at: it feels like your rich friend’s backyard in the suburbs when he does his monthly “bring your squads and let’s get wasted in the afternoon” thing. It’s just super chilled-out with some of the best DJs this side of the beach, and some of the coolest people in Miami. The Standard is not what you’d expect for The Standard hotel group. This hotel is on the other side of the island, away from the packed pool scenes along South Beach, with way more grounds than it can play with. A lush, tropical oasis, it feels like a secluded resort right on the water. But enough about that. The massive pool gets crazy on weekends. Nobody complains about the pool (it’s huge), the way the crowd looks (it’s eclectic) or the atmosphere (it’s pumped). It gets a great breeze, and it also has tons of pool chairs so you’re not hijacking others. The infinity pool (again, massive) has an underwater sound system, and it’s basically right on the sea, so get that waterproof phone case for your Instagramming. There’s a hot tub, cold plunge pool, spa services, and a wooden deck if you want to take paddleboarding lessons. The point is: there is tons to do here (even BBQs and games like bingo), and it’s adults only, meaning you don’t have to feel guilty when you get black-out drunk like everyone else. 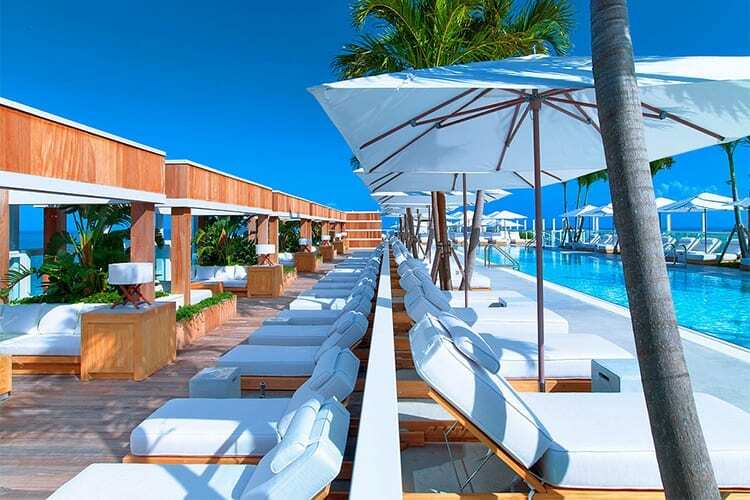 You’re really not going to find a rooftop pool party like 1 Hotel South Beach. In fact, most pools in South Beach are on ground level, so here you not only get a party, you also get insane beach views from 18 stories high. People come, rent a cabana and camp out literally the entire afternoon on the weekends. 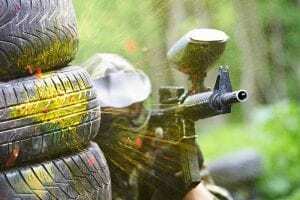 It’s not a fist-pumping environment, more of a DJ playing relaxing beats type-scene, but even so, it’s adults only, so you don’t have to deal with screaming kids either. It’s perfectly chilled out with the right amount of people. It’s also one of the hottest spots in town, so to enter, you really want to be staying at this hotel (we approve) or reserve a table or VIP cabana. Raleigh Hotel is pure old-school, South Beach Art Deco swank. 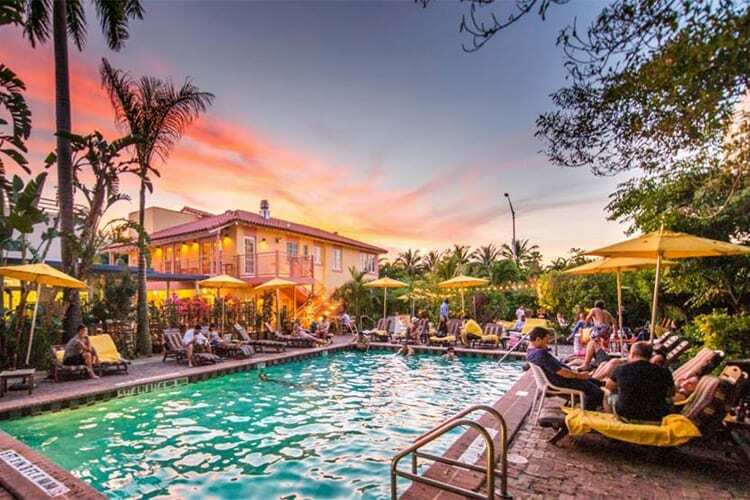 It’s one of those timeless hotels that throws tons of events during the busiest festivals (Winter Music Conference, Art Basel) with celebrity guests staying in their amazing rooms. The two-tiered, 1940s Art Deco pool with vintage diving board is iconic, and you’ve most likely seen it in magazine fashion spreads. With all that in mind, it’s a fashionable crowd of models and model wannabes. Either way, it’s a good-looking crowd for sure. 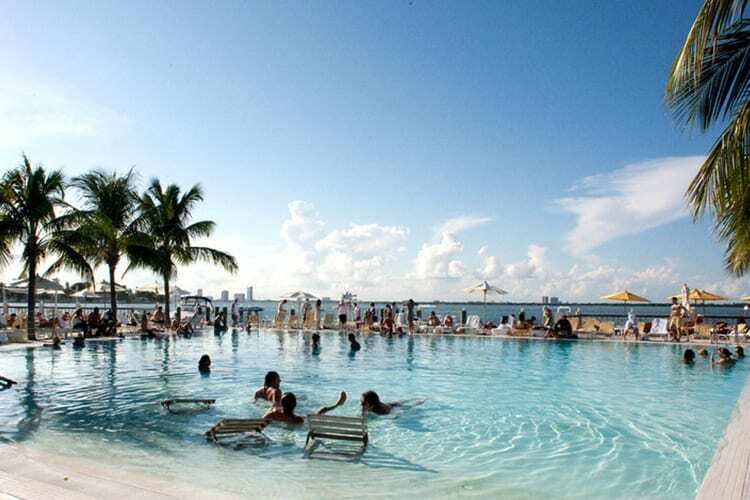 The pool here gets tons of love on Sunday for the pool and beach party that has tons of programming like brunch, yoga, live music, live DJs, the works. You’ll want to book a cabana to really get the royal treatment.